BILLIE HEADRICK has driven several races in the past few years, is driving a Jones Six car which is a stock car. He has lived here for two years but is present employed as head tester for the Jones Motor Car Co. at Wichita. O. L. GRIBBLE, Marion, Kansas. National Car, international fame, once winner of Indianapolis Speedway, 500 mile races, and many of fastest road and track races in America, and holder of many records. G. M. BREED, Buick, well known in Kansas on fair circuits, needs little recommendation, having been in Abilene several times and in nearby towns. The car has won first place in about 90 percent of all races entered. L. D. HESTER and his famous Ford Bug, is here and will show the people some real speed, having created some time on half-mile tracks that is as good as the big races. W. M. CHAPPELL, with his Wescut Special, expects to take off some of the honors of this race. While he has no track record in time trials, he has been able to turn the track in time that is amazing. H. S. ROLLER, with his Ford that has not lost a race this year, will be here to make this race money swell his bank account. E. S. LECKRON, with his Maxwell, is a local entry in the races and if the time made in trials is a criterion, he will be the surprise of the race. Don’t fail to see P. C. Redman in his stripped Maxwell. You have seen him race before and he will drive his usual consistent race. $400. - 5 mile free for all, 2 best in 3, 7 entries. County, 2 best in 3, 4 entries. County drivers, best 2 in 3, 3 entries. Fastest races in central Kansas this year are assured if weather permits. They are for real money in big purses. Remember. October 2, 1915, at 1:30 p. m.
Billie Headrick was born October 10, 1891 at Maryville, Tennessee, to Andrew Douglas Headrick (1870-1947) and his first wife, Susan Jane (Keeble) Headrick (1873-1910). Billie moved with his parents to Sevier County, Tennessee before the family moved on to Anthony, Kansas in 1910. It was while living there that Billie began his auto racing career. Billie moved to Kingman, Kansas in 1911 where he found work as an automobile mechanic. Billie’s father returned to Sevier County, Tennessee after 1912 but Billie, at least one of his siblings (Mattie) and one of Billie’s aunts, remained in Kansas. From Kingman, Billie moved to Abilene, Kansas in 1912. Headrick moved to Wichita, Kansas where he went to work for the Walker-Jackson Coal Company in 1914. He was married on August 22, 1914 in Wichita to Imogene Hobson (1891-1940), a school teacher whom he had met in 1911 while he was working in Kingman. Headrick took a job as the “head tester” for the Jones Motor Car Company in Wichita in the summer of 1915. By the fall of that year, he had been promoted to foreman in the assembling shops of the Jones Motor Car Company. Finish: Headrick entered this 5-mile race but he did not finish in either 1st or 2nd place. Feature race winner: Watkins Reneau of Manchester, Oklahoma. Finish: A newspaper article published five years after the fact, mentioned that Hendrick had competed in these races but what he drove, where he finished, or even who might have won, are currently unknown. Finish: Headrick entered these races but the race results have yet to be located. Finish: 2nd in a 2-car, 1-mile match race behind Carl E. Evans of Wichita, Kansas who was driving a Jones “Six” owned by John J. Jones of the Jones Motor Car Company of Wichita, Kansas. Finish: 1st in the 5-mile feature race just ahead of Carl E. Evans of Wichita, Kansas who was driving a Jones “Six” owned by John J. Jones of the Jones Motor Car Company of Wichita, Kansas. Car: Jones “Six” built by Carl E. Evans and owned by John J. Jones of the Jones Motor Car Company of Wichita, Kansas. Feature race winner: Lee D. Hester of Iola, Kansas driving a Model T Ford “Bug” owned by Basil T. Barber of Iola, Kansas. Finish: 2nd in the 1st 5-mile heat races behind Glenn M. Breed of Salina, Kansas in his 1909 Buick Model 17. Headrick had worked his way up, from his 4th place starting spot, into 2nd place in the final 5-mile heat of the “Free-for-All” when, due to a misunderstanding in the signals, he drove off of the racetrack with 1-lap still remaining in the race. Although Headrick had still been far behind race leader Glenn M. Breed, the share of the purse for 2nd place would still have been $100. Feature race winner: Glenn M. Breed of Salina, Kansas in his 1909 Buick Model 17. There is but one seat on the racer and a passenger is obliged to curl up and hang on – and by the way, there is precious little to hang to. But, when W(illiam) P. Cochran, (advertising manager) of the Jones Motor Car Company, wagered Miss Olive Vail, an Actress who is now playing in Wichita, a box of chocolates that she could not hang on for a mile while the driver opened wide the throttle, he made a bad bet. While Billie Headrick, tester for the Jones company, turned his snorting, ugly machine loose on the North Lawrence avenue road a mile north of town, Miss Vail rode beside him and asked if that was as fast as he could travel. “Maybe you had better not go,” said Mr. Cochran, conscience smitten at the thought of an accident. “Hum,” she smiled and reached for a grey duster and a pair of awful looking yellow goggles. At first, Headrick, a little afraid of his cargo, opened his throttle to 45 m.p.h. The second trip, he did 50 and the last nearly 60 and the young lady grinned throughout the entire performance. “I once owned a Packard and drove it 50 m.p.h. many times,” she said afterwards. Later, she sat beside Headrick as he drove through town to her hotel and, a few minutes later, Mr. Cochran paid the wager with a big box of candy. In March of 1916, the Headricks moved to Saint John, Kansas where he took a job as foreman and inspector of the auto mechanic at The Travelers’ Aid Garage. A year after later, the Headricks had moved to Stafford, Kansas where he went into business as a self-employed automobile mechanic. In 1918 and 1919, Hendrick operated his own auto repair garage in Wichita. In 1920, Hendrick sold his garage in Wichita and the Headricks moved to Anthony, Kansas where he went to work for good friend and fellow auto racing driver, Jimmie Costa, Jr. (1891-1922), at his Hale & Costa garage. Costa had been one of the first people that Headrick had met when he moved to Kansas. By 1924, the Headricks had moved to Arkansas City, Kansas but, by 1925, they had returned to Wichita where Billie opened the Headrick Auto Company garage on North Emporia Street. Billie and Imogene Headrick divorced and Billie moved to Bisbee, Arizona where two of his sisters (Nancy Fielder and Lettie Caretto) resided with their families. He took a job there as an auto mechanic while he waited to meet the residence requirements of Arizona. He then married Osa Cavender (1900-? ), a divorcee from Wichita, Kansas, on December 26, 1929 at Tombstone, Arizona. After the ceremony, the couple returned to Wichita. The marriage must not have lasted vert long though, as, less than one year later, Osa was living by herself in apartment in Wichita using the name “Mrs. Osa Cavender”. 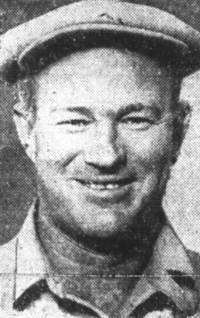 Billie Hedrick had taken a job as a machinist with the Aero Parts Manufacturing Company in Wichita when he passed away of a heart attack while in his bed at his home in Wichita in the early morning hours of June 16, 1943. He is buried in Wichita Park Cemetery in Wichita. At the time of his death, his third wife, “Beulah Headrick,” was away, working the overnight shift at the Cessna Aircraft Company in Wichita. He had no children. This very poor-quality, posed publicity photo was taken on the ½ mile racetrack at the El Dorado Fairgrounds at El Dorado, Kansas in June of 1915. It shows Billie Headrick at left in the Model 10 Buick race car owned by George T. Walker and known as “Hellen Blazes.” On the right is Max Wilson in his own stripped-down Ford. All three men were from Wichita, Kansas.